This Mariner's Compass, measuring 90" x 94", is a remarkable quilt made by a teenager in approximately 1850! It's magnificent appeal is a result of the fabric choices and the skillfully executed sashings. The Compasses actually " float" atop the crisp, white background. A native Vermont quilt, it has been displayed at the Vermont Quilt Festival, and exhibited at its home base, the Shelburne Museum. It has also graced the cover of Plain and Fancy by Richard Cleveland and Donna Bister. Enjoy reading the history and learning how the original quilt was constructed. The pattern includes instructions for hand piecing, machine piecing, freezer paper AND foundation techniques. A full pull-out pattern sheet is included with template shapes and the foundation patterns. Truly a technique for everyone! 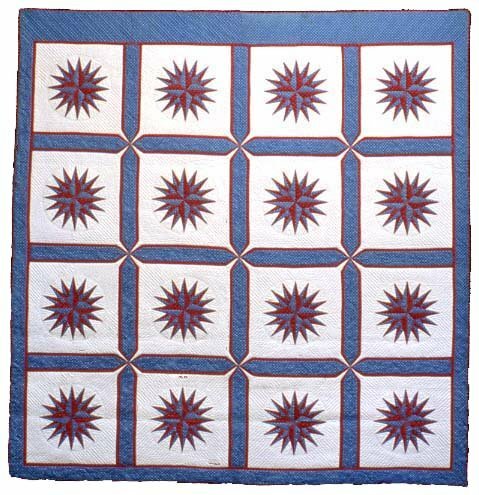 The quilting stencil taken directly from the 1850 quilt is also enclosed.